What if I told you there is a way to discover who you are created to be? A lot of the time we go through life just trying to keep up, and the idea of realizing our dreams or discovering who God created us to be seems ridiculous. We are surviving, just trying to get through each day. Just last night I sat in a circle with a group of women, practically strangers, as we talked our way through last week's lessons from Children of the Day (a wonderful Beth Moore study). When one woman spoke up that she wasn't sure if she was doing what's she's supposed to be doing. That she feels she needs to be doing BIG things like some of the prophets in the Bible and missionaries around the world. As I glanced around the room at the faces of the other women, each were nodding in agreement. We all want to know that what we are doing matters and is kingdom worthy. I wish I could have given my new friend this Life-Growth Guide I have been reading. It's a wonderful new tool from Holley Gerth that is a companion book to "You're Already Amazing." The Life-Growth Guide has six easy to read sections which contains quizzes and charts to help you recognize your skills and strengths. Once you realize what you are good at, then you can think of creative ways to use them in your everyday life. "All of the roles we have in this life are temporary. Who God made you is eternal. A thousand years from now you will not be in the thick of motherhood or at a particular job. But you will still have your strengths and skills." We are meant to discover who we are in Christ and live boldly. When you discover your skill-set you will use them in whatever capacity God has you in at the moment. Never before has there been such a thorough book to go through in a group setting with other women to read, watch, and discover your talents. I can almost see the lightbulbs going off and the eyes lighting up when women across the globe realize how specifically they were created. 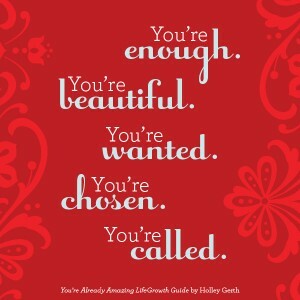 The Life-Growth Guide has a companion video, and together, along with the "You're Already Amazing," book, you are all set to discover who God created you to be. Each chapter begins by asking you to read a chapter(s) of "You're Already Amazing," (but you don't have to have the book)then work through the Life-Guide lessons. Each session begins with an intro, and then moves into exercises for you to complete to dig deeper. And concludes with Your Life Coach, and a journaling page. The Your Life Coach section is like sitting down with your own personal life coach, that is what I think is so neat about this new book. Who wouldn't want to sit across from Holley and flesh out your answers more to the previous questions? 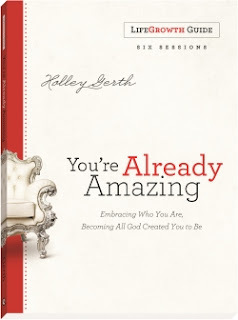 I already really enjoyed Holley's book, You're Already Amazing, and with the Life-Growth Guide and video added as companions, I like it even more. I may start a small group just to watch eyes light up for myself! The Life Growth Guide goes on sale today! 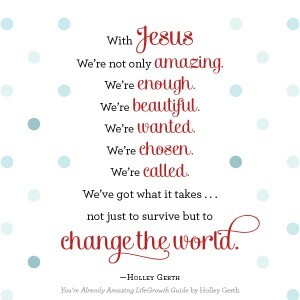 Thousands of women emailed and begged Holley for this group guide and I got to say, she really delivered! I think you are going to LOVE this latest offering from Holley! What do you think your strengths, skills and who you are called to serve are? Will you join me over at Holley's to help her celebrate her latest release?